The timing for Pacific Opera Project's Abduction from the Seraglio March 6-8, 2015 at the El Portal Theatre in North Hollywood couldn't be more tragically perfect. The staging is yet another creative bit of genius from Josh Shaw, the raw creative force and driving factor behind the now five-year-old endeavor to make opera fun and accessible again; and it involves taking a work by Mozart and staging in to an episode of Star Trek, Romulans, Klingons and slave girls galore. 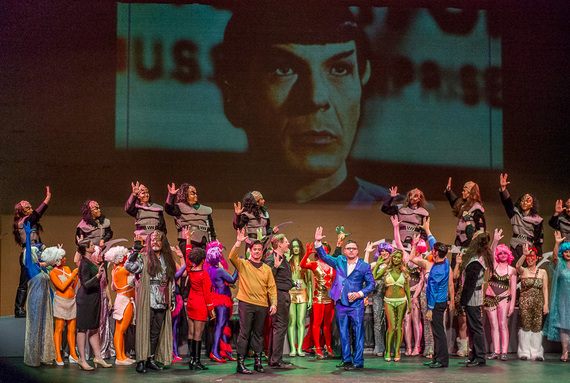 When choosing to do this, no one from Shaw on down could have known that just the week prior the entertainment industry would lose an asset and the world an icon with the passing of Leonard Nimoy, whose portrayal of Mr. Spock has touched generations since the 1960s and who went on to be a driving factor in bringing science and art together. Abduction from the Sergalio is over-the-top homage to the series and its lead characters that takes the age old operatic themes of boy meets girl, girl turns out to be lustful sinner, girl kills herself or sacrifices herself for man or virtue or other such age-old dramas and present the scenes as one giant campy Start Trek episode. And it works in a big way. This production is yet another step in Shaw's dream; a dream I would have never seen grow first-hand if it wasn't for my friend and Pacific Opera Project chorus member Daniel Charleston. Four years ago he dragged me along to a production, a group of dedicated opera fans staging something in a coffee house or some such and the strangest thing, I enjoyed myself. You see, I didn't get the Opera gene, which shocks a lot of people because I'm gay. I got the Dance music gene. Avicii, Guetta, Knuckles, Benitez, Moroder, them I know; Verdi, Mozart and others, not so much. But I do like a good night of theatre. It was Charleston who told me of Shaw's vision to return opera to the streets, where it started. Singers belting out tunes, no amplification used (still) for all classes of people, especially the young, the poor, the average people. It wasn't old and stuffy, it was the stuff of high drama that could be made relevant. So over the last four years I have seen Tosca set in an actual church (where it really occurs in original writing) and then moved outside to a courtyard to watch it under the stars as the scene would have actually been at a garrison. I've been to high school auditoriums, regular theaters (The Highland Park Ebell is a new home), I've seen La Boehemeat a coffee house and now a production in a larger theatre with assigned seating and a wine bar. And each time, each production grows. Shaw is a relentless fundraiser, and his wife always searching for the perfect venue. A pit is important, because every $1000 raised is another musician for it; brining live music along with the show is important. I've watched their conductor / accompanist Stephen Karr go from playing the entire show himself to conducting 12 to 20 pieces. Set designers, costumers, makeup artists, you know, ARTISTS, theatre people, all working, all giving, all for the show, the cause. And it is a cause. This time, Shaw wrote a large portion of the English libretto (I'm not really sure what that means except that Mozart didn't know from Star Trek so something had to be rewritten). 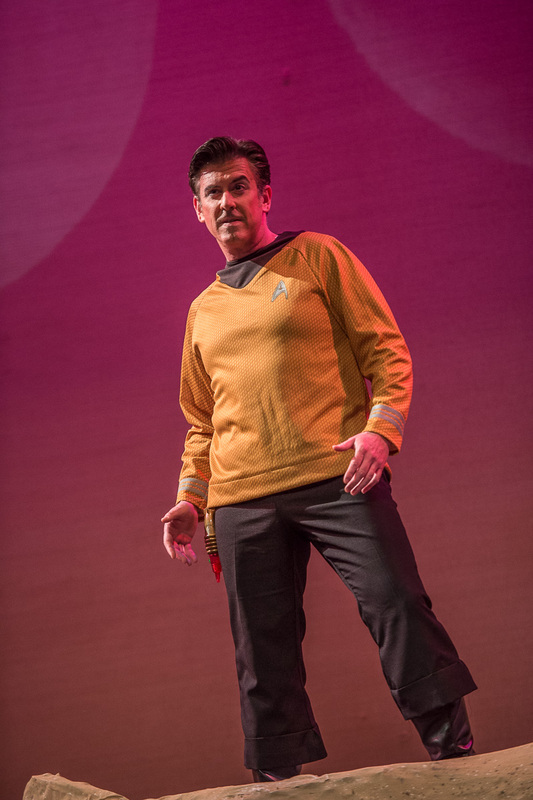 Brian Cheney, who has been a lead in several productions, is ham-bone supreme as Kirk / Belmonte. Shawnee Sulker is Uhura / Constanza IS Nichelle Nichols in her prime, but with a gorgeous soprano. Robert Norman as Spock / Pedrillo has just the perfect deadpan to be Spock, and yet the slyness and humor of Nimoy's character that always battled with his human side. Claire Averill as the required Slave Girl / Blondie brings the Jersey Shore to space and plays it so well that her incredible soprano almost comes as a shock! Phil Meyer almost seems to have the most fun as Osmin / Evil Klingon and Gregg Lawrence's speaking role as Chancellor Belim adds a great acting component. But this show never forgets it is camp fun and the hard working chorus helps us transition from scene to scene, each sparsely done like the TV show itself. Vivid colors, dancing slave girls and aliens of all kinds, a tribute to a series embedded in pop culture itself and exposure to live music, Mozart, singing, playing...it appears Shaw and his troupe has succeeded in their mission. I am not a fan, well, I'm to a fan of traditional opera; Pacific Opera Project? I love. And other Opera's like L.A. Opera are taking note and staging unconventional presentations of classics all around the country. Opera is reinventing, changing, and reaching for millennials. Shaw is bringing them in, hundreds at a time, along with the older opera crowd looking for something new and fresh. It's fun to find something new, something groundbreaking, an expansion and growth of art that's thriving; dreams being reached instead of dashed in a business of broken hopes. In five years the troupe will have their choice of stages and stars, but something tells me the loyalty that is felt throughout this troupe of die-hard opera performers will hold and their stars will only continue to rise as does Shaw's and his Pacific Opera Project. I cried Friday night , March 6th 2015 in a small theatre in North Hollywood when a slide of Leonard Nimoy as Spock illuminated the stage above the cast. I was that kid, in my underwear, making my hands in to that sign, that Live Long and Prosper sign; I studied everything so I could be that smart. I fought with letting my true emotions run free in place of reason, just like Spock. I balled out loud in the movie when he died and jumped for joy in the next when he came back. In the recent franchises I've seen every one, especially with the old cast meeting new ones. Hell, we named our first space shuttle Enterprise. Opera is supposed to entertain and make you laugh and cry. Mission accomplished Shaw, Pacific Opera Project cast and crew. In the words of your vernacular, Bravo!